Please remember: These are unofficial parts. They may be incomplete or inaccurate, and it is possible that when they are officially released they may be changed in ways that could mess up any model you use them in! Generally, LDraw.org recommends you to grab unofficial parts one-by-one from the LDraw Parts Tracker and use them only for a specific project. But, if you're impatient, sure you want all of the unofficial parts and are willing to take your chances, you can download all of the unofficial parts at once. 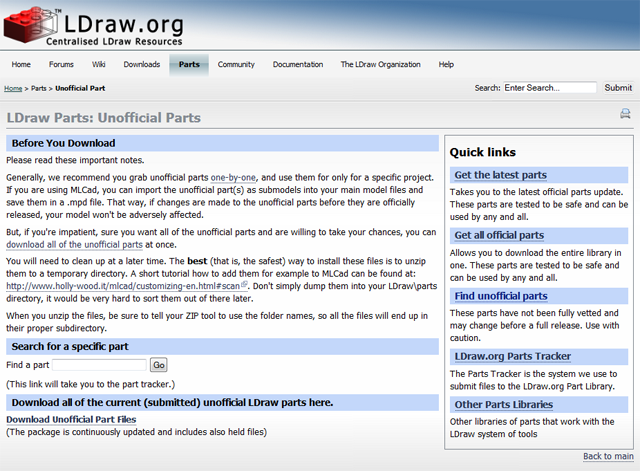 Navigate to the LDraw Parts: Unofficial Parts page at LDraw.org, click the link Download Unofficial Part Files and save the ldrawunf.zip file to your harddisk. NOTE! The package is updated every 5 minutes, but if only there have been any changes. 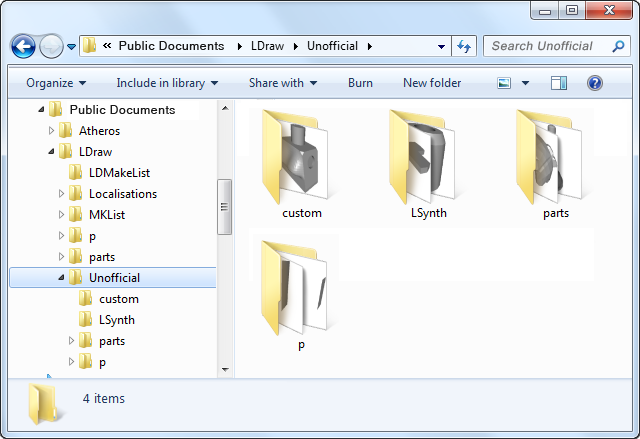 It contains ALL unofficial parts currently submitted to the LDraw Parts Tracker. This includes also parts with a Held vote which have some issues and might radically changed before release. But also parts with one or two Certify vote(s) may be incomplete or inaccurate, and it is possible that when they are officially released they may be changed in ways that could mess up any model you use them in. This is most true for rotation and origin. See below a worst-case-scenario where origin and rotation of the slopes and the tires have been change for the official release. 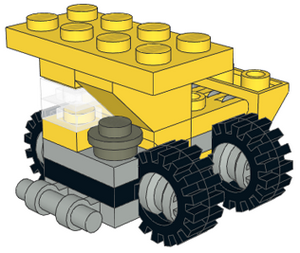 You could simply dump the parts into your LDraw\Parts and LDraw\P directory and rebuild the parts list file Parts.lst by selecting File > Scan Parts in MLCad – but it would be very hard to sort them out of there later. The best (that is, the safest) way to install these files is to unzip them to a directory named Unofficial in the LDraw Parts Library directory. NOTE! Some of the major LDraw program authors have agreed to adopt this location as a de-facto standard after the LDraw Standard Committee - LSC has rejected (voted down) on March 07, 2007 a proposal to make the "Unofficial" directory an official location for unofficial and custom files. NOTE! Unzipping an archive file into an existing directory is an additive process. It is recommended that you clean out or delete the Unofficial directory each time you unzip a new download. Otherwise you risk accumulating files that have later been renamed and will never appear in the official library with that number. In the next step you're gonna tell MLCad to include the folders in its parts library. Browsing MLCad's root folder you'll come across a file named MLCad.ini, which – among other things - defines the order of scanned folders during the launch of MLCad. This feature has been thought to include unofficial and custom parts into MLCad, without the need to mix them with the official LDraw parts in the \Parts and \P folders. Part files with the extension .dat found in the scan will be included in the parts library and - depending on the flag - show up in the Parts Tree and Parts Preview pane. Take notice that this feature is NOT equal to the File > Scan Parts command and therefore will NOT rewrite the Parts.lst file. NOTE! The start-up of MLCad will be slowed down depending on the number of folders and sub-folders to be scanned. Time to do a little bit of hacking. If for some strange reasons your installation doesn't come with a MLCad.ini file download it from the MLCad.ini tutorial page. The MLCad.ini file is a simple text file, which supports extended ASCII-code and is editable in an editor or a word-processing program, but since it is stored in the Programs Files (x86) folder the text editor has to run as administrator with full elevated rights and privileges on Windows Vista or higher. 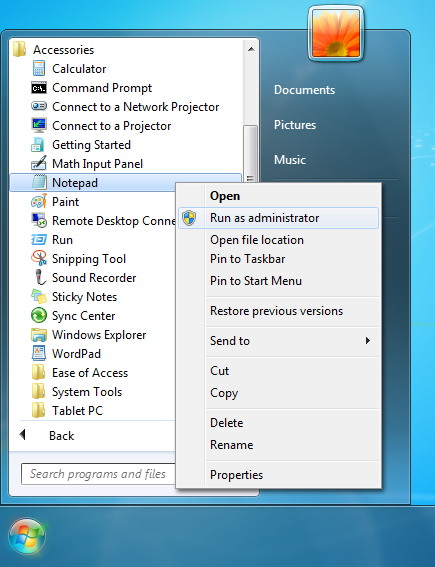 Right click on the program's shortcut and click on Run as administrator. If prompted by UAC - User Account Control, click on Yes to apply permission to allow the program to run with full permission as an administrator. NOTE! If you are doing this is while logged in as standard user instead of an administrator, then you will need to provide the administrator's password before the program will run as administrator. If the keyword <LDRAWDIR> is omitted the path is assumed to be an absolute path. ["]Pathname["] Subdirectory inside the LDraw base path or absolute path including the drive name. Note that if your filename contains spaces, the entire filename must be enclosed in double quotes. (This is standard for any Windows command line with long filenames). This can happen because sometimes LDraw.org changes already official files to move code in or out of their parents. Whilst at Parts Update time they ensure that fixes to all dependent files are released together, they won't all necessarily exist on the LDraw Parts Tracker at a particular point in time. The most common case is when an existing official part is subparted to allow for patterning. The symptoms depend on what has been changed and in what order the author adds the new subpart and its parent to the Parts Tracker. 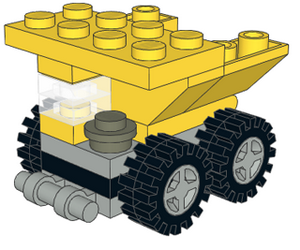 If the parent is added first there will be missing surfaces until the subpart is added. If the interface between a subpart and its parent get changed then even adding the subpart first may cause problems if it takes a while to upload all it related parents. The downside is: Since the scan order in MLCad.ini defines what version of a part you will see, an updated part in the unofficial folder, will only be seen in MLCad if you remove the official version from the ordinary \Parts folder. Sounds weird? I'll show you my personal settings to get you a clearer picture. It should however never be the case since the <LDRAWDIR> keyword gets defined as environmental variable by the LDraw All-In-One-Installer during installation. Before you start defining absolute paths it is might worth investigating what's wrong with your environmental variable. NOTE! Opening the MLCad.ini file shipped with the LDraw All-In-One-Installer or downloading it from this website you will notice that those directories are already included, but have been commented out. To activate the scan just delete the semicolon in front of those two search paths (don't forget to run your editor as administrator). Save the file and launch MLCad. The Parts Tree as well as the Parts Preview Window should now contain the unofficial parts and can be used like any other part.